Super Bowl 50 was the most-streamed Super Bowl game ever, but it didn't break the NFL's own livestreaming record. As it announced this year's Super Bowl audience—111.9 million, the third highest in Super Bowl history—CBS said its livestream of Sunday's game averaged 1.4 million viewers per minute. That represents a Super Bowl record for livestreaming. The 2015 game averaged 800,000 per minute for NBC. Fox's stream averaged 528,000 viewers in 2014, while CBS had 508,000 in 2013. NBC drew 346,000 viewers for the first livestream of a Super Bowl in 2012. However, the 1.4 million average was less than the audience Yahoo drew in October for the first exclusive livestream of an NFL game, which unlike the Super Bowl was not available on TV. An average of 2.36 million people worldwide—1.64 million of those in the U.S.—streamed the Buffalo Bills-Jacksonville Jaguars game, which took place in London. CBS said 3.96 million unique viewers watched Super Bowl 50 across all devices, including CBSSports.com on PCs and tablets; the CBS Sports app for iPad, Android, Windows 10, Amazon Fire, Apple TV, Chromecast, Roku and Xbox One; and NFL Mobile from Verizon. Users consumed more than 402 million total minutes and watched more than 101 minutes on average. While the livestream held up well all evening, the feed was consistently about 30 seconds behind the linear telecast. In a Super Bowl first, this year's livestream ads were bundled with the linear buy, meaning digital audiences saw the same national ads as those watching the game on CBS. 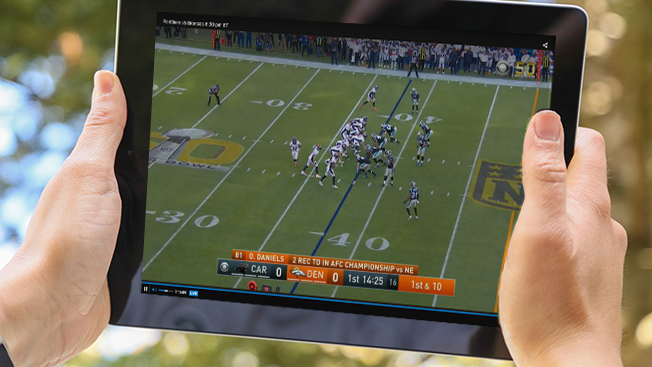 "There's 100 percent participation, so it will be a nearly concurrent experience, both on-air and online," Tony Taranto, svp of NFL sales for CBS, told Adweek last week, adding that the new arrangement was "readily accepted by the ad community."